One of the most intriguing aspects of our fascination with the lives of the members of Britain’s Royal Family is how little we really know about them. Although perhaps one of our most public institutions, it is striking that we know only snippets of their ambitions, their disappointments, their hopes and dreams. Indeed, behind the ermine robes and bejewelled effects of state, it is easy to forget that underneath all the impressive pomp and pageantry lies a human being. This is the key theme which runs throughout the latest production of The Audience, which is currently showing at London’s Apollo Theatre and is certainly well worth your patronage. 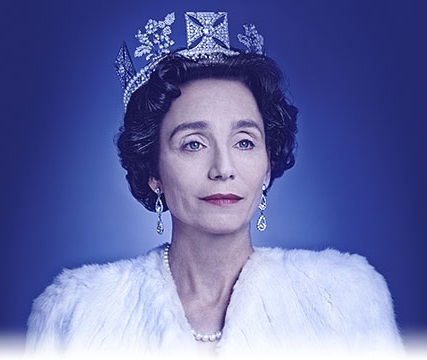 Following the success of an earlier run starring Dame Helen Mirren, this revival features another Dame, Dame Kristin Scott Thomas in the lead role of Queen Elizabeth II. Set in the period following her ascension in 1952 right up to the present day, the play follows the weekly audiences given by Her Majesty to her prime ministers in what is constitutionally termed an opportunity for the PM to inform the monarch of the events of the past and future week. It also allows for Her Majesty to informally ‘guide’ her prime minister, though she is always expected to offer her public support regardless of personal feeling; an intriguing scenario, particularly since minutes are not taken for these meetings and the details of what is actually discussed are left wide open to speculation. The conflict between personal feelings and duty is brilliantly portrayed by Scott Thomas, who manages the impressive task of portraying a character at varying stages of her reign, each characterised by a different context and informed by a varying level of experience. The synergy between Scott Thomas and her various prime ministers is joyful to behold, particularly the exchanges with Nicholas Woodeson’s Harold Wilson who injects a huge degree of charismatic energy into the production. Indeed, the strength of the cast is paramount to keeping what is essentially a bottle-play engaging throughout. The minimalist set also aids in this respect, and Stephen Daldry should be commended for presenting a certainly effective audience chamber populated by believable characters that could so easily slip into caricature. This play also has an intriguing aspect which is well worth a mention: it is updated quite regularly. At the production I attended, it just so happened to be performed during the Election period. Unexpectedly, it includes an extra scene featuring David Cameron bemoaning internal party divides over Europe while requesting that the Queen dissolve Parliament. While I certainly enjoy this reference to present events, this scene is, I must admit, somewhat gimmicky, particularly since it fundamentally rests on the joke that the Queen happens to have a funny ringtone. The scene was clearly written with some haste and feels generally out of keeping with the otherwise high quality of the rest of the script. Nevertheless, this evolving feature is certainly a reason to attend this revival should you have seen a previous iteration. A treat for anyone with even a modicum interest in what goes on behind the doors of the audience chamber at Buckingham Palace, The Audience provides a fascinating insight into the life of someone with an arguably politically richer experience than anyone living today. Even for someone not particularly interested in politics, the struggle of a woman in the unique position of balancing an almost inhuman role of monarch with the very human self is thoroughly worthwhile. Indeed, an audience with The Audience is an absolute pleasure.